Mark Webber (2nd, 1:32.547): "We tried to do as much as we could in 90 minutes; we put both compounds on and did different fuel loads as well, so it was quite a demanding session for the team. In the end we got what we could out of it. I think that both Seb and I ran different compounds and got the information we need for the race. Today we did a snapshot of work for tomorrow, but mostly the focus was for Sunday. I think the race will be quite tight, to be honest I don't think there's anyone charging away." 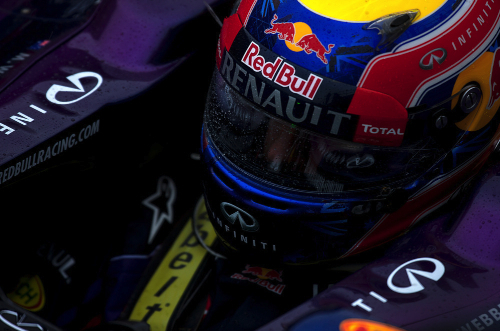 Sebastian Vettel (3rd, 1:32.680): "I think overall we can be pretty happy, it was a good day. Obviously it was important to get some laps in the dry as we expect dry conditions on Sunday. Now we need to have a look at what we can improve, have a look what the others did and then we'll know a little bit more for tomorrow. Today we tried to do both short and long runs. For FP3 tomorrow, we need to decide if we go for short runs, to prepare for qualifying, or long runs trying to look more at the race set up." Fernando Alonso (10th, 1:33.494): "This morning, we lost the first session because of the rain and had to squeeze all the work we had been unable to do into the afternoon session. Our programme for today was no different to usual and as normal, it was important to gather data relating to tyre behaviour, which here too will be the key factor. At Silverstone, you need an aerodynamic package that is suited to the combination of fast corners that are the main feature at this track. The strategy will have to be impeccable and in order to make the right choice for the race, we will have to take into account the fact that on Sunday we can expect very different conditions to those we saw today, because the track will definitely be drier and the temperatures higher." Felipe Massa (22nd, 1:43.466): "I am very disappointed about what happened today as the accident cost me valuable time, especially in terms of getting an understanding of the tyre behaviour here at Silverstone. At the exit of the corner, I found myself on a piece of track that was still very damp and I lost control of the car: at that time, the prototype Hard Pirellis that we could use today, were not yet up to temperature and I couldn't avoid the impact. Luckily, the car only suffered slight front end damage and tomorrow we will comfortably be able to pick up where we left off with the work. On a long run, Fernando's car went well and even if the low temperatures probably didn't help, the improved weather expected tomorrow gives us reason to be optimistic. I am certain that together we will try our best to improve so that we can take the fight to our main rivals." Pat Fry: "I'm sorry for the fans who packed the circuit today, who did not get to see the show they were expecting, because of the rain. In the morning, track conditions were extremely difficult and with the few sets of tyres available, we preferred to stay in the pits, as did almost all the other teams. In the afternoon, we tried to catch up the time we had lost. Alongside the usual task of finding the best set up to suit the tyres, we also worked on the development and mapping of the aerodynamics. After Felipe's accident which came after just a few laps, a large part of the team concentrated on Fernando's car, paying particular attention to the behaviour of the Medium tyre. Tomorrow, we can expect different temperatures and therefore conditions that will be more favourable to carrying out a proper evaluation of the car set-up and of all the details which can influence its behaviour over both a short and long run." Jenson Button (11th, 1:33.740): "Despite this morning's washed-out session, I think we got in all the running that we needed this afternoon, and we managed to get through most of our programme ‘ including some running on Pirelli's test tyre. The car doesn't feel too bad out there, and the balance is reasonable ‘ it's better than it was in Canada ‘ but we're still some way off the pace. Still, the engineers have lots of data to analyse, so they'll be able to find out whether the new parts have made the improvements that they'd predicted." Sergio Perez (14th, 1:34.130): "The second session was quite productive; we managed to do a lot of work and run through all our preparations, so it wasn't a waste of a day. Nevertheless, I think we're in a similar position to the last race, and still quite far from the front. We've worked to improve ride-quality ‘ and I think we've made a step forward in that area. However, not everything we tried today worked properly, so I still think we can aim to turn this weekend around." Martin Whitmarsh, Team Principal: "We do seem to have been affected by an unusually high number of rained-out Friday practice sessions this year. While it's the same for everyone, it can be frustrating when you're trying to run through a large and intensive programme of testing. While we were able to get quite a lot of mileage under our belts, there's still plenty of work left to do. It's been a difficult day, but with drier weather forecast for the next two days, we're hopeful of making progress." Romain Grosjean (9th, 1:33.322): "It was a solid day here at Silverstone. Thankfully, the rain stopped for this afternoon and we could get some good laps in so we can make a call on setup and configuration for tomorrow. It's hard to say exactly where the car is due to the conditions we had, plus we ran with a lot of different tyres so my engineers will have a busy evening checking the info to work out what's best. The car feels good; I think if we can improve in a few areas we could be well placed for qualifying." Kimi Raikkonen (13th, 1:34.120): "We're reasonably happy with everything today. We put quite a lot of effort into testing the new Device with feels pretty okay. I only ran with the development and hard tyre so didn't go for a faster lap, but it didn't feel too bad and we can work out where everything will be once we put it all together. I don't think we're one of the very quickest, but I don't think we'll be too far away." Alan Permane, Chief Race Engineer: "After a wash-out in the morning where we elected not to run, we had a productive afternoon. Kimi was happy with the balance of the car with the Device fitted and we made some tweaks to it by trying different settings too. All appears to be working well and we have a good amount of data from which to decide if we will run it for the rest of the weekend. Romain's car also looks to be working fine with the new aero package. We're not concerned by the lap times this afternoon; Kimi didn't use the softer tyre while Romain ran with it very early in the session, so we're happy that we will be more competitive than we were at the last race." Nico Rosberg (1st, 1:32.248): "It was a pity for the fans that we didn't do much running this morning so it was good for them and for us that it was dry this afternoon. On one lap the car is still quick, so qualifying should be okay. But the question mark is our race speed. We practised the race speed today and it felt decent so far. But it could be a completely different picture on Sunday as the weather should be a lot warmer, so we don't know where we are right now compared to the others. I'm still quite confident that we can have a good weekend in front of our fans, our colleagues and their families." Lewis Hamilton (5th, 1:32.911): "We had quite a challenging day today and definitely have more to learn tomorrow. I'm struggling a little with the balance of my car so there's some work to do overnight to get us into shape for qualifying. We haven't quite got it hooked up yet and you can really tell that on this circuit, particularly with Becketts and Maggots. I'm confident we'll fix it tomorrow though. It's great for the British fans here that they were able to see some track action this afternoon after the rain this morning and a big thank you to everyone for sticking with us. Hopefully the weather will improve tomorrow!" Ross Brawn, Team Principal: "After the wet morning, we had a good session this afternoon and managed to get some useful work done. The conditions today were cooler than we expect for the rest of the weekend, and the track was very green, so we must be careful with the conclusions we draw from our running. The unrepresentative conditions today mean that we will be relying on projections in order to choose the right car set-up for Sunday, so if we get that slightly wrong, we may find ourselves hurting in the race. Today was not too bad in terms of performance and the car had a reasonable balance, which helped us collect some good information on the different tyre compounds with medium and high fuel loads." Toto Wolff, Mercedes Motorsport Director: "After it rained through first practice, it was good to do plenty of laps this afternoon and we had a decent session. We can't read too much into the results but we ran slightly different programmes with the drivers to learn as much as possible. Now we need to analyse that data and draw the right conclusions for the rest of the weekend, when we expect quite different conditions to today." Nico Hulkenberg (12th, 1:33.896): "We couldn't really learn much this morning, especially because it is supposed to be dry tomorrow, but here you never know. However that was the same situation for all the teams. The second practice this afternoon was good. We were able to change to dry tyres fairly quickly. Of course, the programme is a bit different without having a proper FP1 and it can get hectic sometimes, but I think we managed to work through the programme quite well. We learned a lot about the tyres and had a good, consistent long run. The set up of the car can still be improved, but that is normal after loosing so much time this morning." Esteban Gutierrez (15th, 1:34.998): "This morning was a little bit frustraiting. It was too wet and we had to wait quite a long time to go out. Tommorrow is supposed to be dry, so it didn't make sense to run in the wet. Fortunately it was dry in the afternoon and we managed to get a good number of laps on all three tyre compounds and high fuel, so that was positive. We were getting consistent laps and now we need to evaluate the two different set ups we had on the cars. It seems Nico's configuration was a little bit better on the downforce, especially in the fast corners. So now we need to evaluate the data and make a decision for qualifying tomorrow." Tom McCullough, Head of Track Engineering: "The rain was a bit too heavy this morning to warrant doing much running, and we also have had a lot of experience of where we are running in the wet so far this year. This afternoon with an improving track it's never ideal for comparing set-ups, but we managed to get through our main test items. Nico was reasonably happy with his new option tyre run, but we still have some work to do with regards to long-run pace if we want to have a strong race on Sunday." Paul di Resta (4th, 1:32.832): "After such a wet morning it was nice to get a run in the dry this afternoon. It was pretty productive and the car is working well so hopefully we can carry the speed into tomorrow. We didn't run very much this morning, but with dry conditions expected for the weekend I think we've learned as much as anyone. The focus tonight is to keep improving because there's still some more speed in the car. We also need to remember that it's likely to be quite a lot hotter tomorrow so it's hard to predict how that will impact on things." Adrian Sutil (8th, 1:33.313): "We looked quite good today. There are areas to improve, especially the performance on the medium tyres, but the car is working well on the hard compound. I'm happy with the balance so the main thing we need to work on is going through the tyre data because I don't think we need to change too much on the car set-up." Jakob Andreasen, Chief Engineer: "Despite the wet weather this morning we made the most of the afternoon. There were a couple of new developments on the car and we managed to get most of the information we needed. We also ran the hard compound prototype tyres on both cars early in the afternoon session before we focussed on the regular compounds. Both Paul and Adrian managed to complete representative runs on each compound and we have all the data we need to make the decisions tonight. For tonight we will turn our attention to making sure we can qualify well and understanding how to get the tyres in the optimum working window." Valtteri Bottas (16th, 1:35.070): "Conditions were not ideal today, especially as we were trying to test new parts on the car. It's the same for all teams, but I really feel for the fans as they didn't see much running. We managed to test with both the prime and option tyres in the second practice session, so we'll look at the data tonight and assess where we need to improve for the final practice session and qualifying tomorrow." Pastor Maldonado (17th, 1:35.127): "I was running a different programme to Valtteri today, concentrating on mechanical work and tyres. We lost a lot of track time in the first session due to the weather, so we had a busy afternoon. I was also able to do a longer run towards the end as the track dried but we still have work to do to improve the performance for tomorrow." Mike Coughlan, Technical Director: "It was raining this morning so we could only run on full wet tyres in FP1 to get a feel for the balance of the car. Our test programme was therefore shifted to FP2, so we didn't run the prototype tyre as we needed time to get through all the changes we had planned. Pastor was doing mechanical tests, whilst Valtteri did aero evaluations with two different packages we have here. We gathered all the information we needed so now we will analyse the data to decide which direction to go. Both cars will run with the same configuration tomorrow." Daniel Ricciardo (6th, 1:33.171): "I decided to do quite a few laps in the rain this morning, as I felt the track was safe enough and you can always learn something in those tricky conditions and I think it pleased the fans as well! This afternoon, we were pretty good in the dry, getting a good run on the Hard compound and improved further on the Medium. However, I had hoped our long run would be better, so we definitely have more work to do overnight, but generally a positive day." Jean-Eric Vergne (7th, 1:33.290): "This afternoon, as soon as I left the garage, I could tell the car felt very good. It was easy to push and my lap times were good. That doesn't mean we're going to relax, far from it and we will be working hard tonight to look at all the data to see how we can improve. I feel we have a chance here to do well over the rest of the weekend. Coming to this track which is so different to the last two ones we have raced on, I would say today's performance has been a pleasant surprise." Laurent Mekies, Head of Vehicle Performance: "This has been another good Friday for us. The morning session was held in very wet conditions, but we still felt the need to go out on track to check the car in this situation: lately we have had quite a lot of running on Intermediates, but less so on Extremes, so it was a useful exercise. In the afternoon, we had to squeeze our programme to make up for the lost time in the morning. We had a few new aero parts to evaluate, as well as trying some changes on the mechanical side. We shared the workload between the two cars. The results from today would indicate we are progressing steadily in relative terms from race to race. Now we must study all the data, knowing we can expect rather different and drier conditions for the next two days, so tonight we will try and put everything together to continue to move forward tomorrow." Giedo van der Garde (19th, 1:35.984): "The morning session was obviously affected by the rain which is a shame, both for the fans who packed out the stands, and for us with the plan we'd set for FP1. We wanted to run through a few aero evaluations, particularly as we have a couple of new updates to the floor here, but with the track as wet as it was, and no sign of the rain stopping, we played it safe in the morning. In the afternoon it was much better weather and we had a pretty good session. We had to try and make up some of the time we lost in FP1 and, while we couldn't run the full aero tests, we were still able to make some decent progress throughout the session. The GP2 cars had helped dry the track a bit so we were able to push from the first run and we ended up with a fairly good balance on both compounds. We're seeing a bit too much oversteer on the mediums, especially in the low speed corners, but not in the high speeds ‘ there the car feels balanced and that's positive, something for us to work on tonight." Charles Pic (20th, 1:36.079): "We knew from the forecasts that FP1 would be affected by the weather but it made the whole session pretty worthless. The installation lap was fine but then we waited until about ten minutes to go when there were quite a few other cars on track and unfortunately I went off in the last corner. We obviously didn't lose much time relative to the other cars as everybody had stayed in the garage, and when we got the car back we found everything was ok so it didn't affect our preparations for FP2. FP2 was dry, still colder than it looks like it'll be on Saturday or Sunday, but we completed a good number of laps and have a lot to work on tonight. We've found a balance I'm happy with and the grip levels are good from the outlap ‘ we need to work on the low speed traction as we're lacking a bit in that area, but deg levels look manageable, especially with the prime, so overall I think we're going ok here." Jules Bianchi (18th, 1:35.802): "It has not been an easy start to the Team's home Grand Prix but we kind of expected these conditions for today. Although we are not expecting any further wet weather during the weekend's running, we have made the best of things and used this opportunity to work on wet set-up generally for future races. I'm looking forward to some dry running now so we can really start to attack the circuit and see what we can do here. It's a fantastic track and it will be nice to get a better taste of that tomorrow." Max Chilton (21st, 1:37.329): "Despite the tricky conditions, it has still been a great day here at Silverstone in front of the home crowd. The good news for them is that the weather looks set to pick up for the remainder of the weekend; but it's a testament to the dedication of the fans that they stick with it, even in the rain. I hope we can reward their support this weekend. The day got off to a slow start which set us back a little in terms of our programme, but we've made some good progress this afternoon, particularly with some more long-range set-up work in the wet. No doubt that will come in handy at a couple of the remaining European rounds. It will be good to tackle the circuit in the dry tomorrow and properly assess how the car will perform here." John Booth, Team Principal: "The British weather made for a difficult start to our programme and required us to switch focus a little from our normal aero test in FP1 to wet set-up in general. At the start of FP2 the track was again wet, so with Max we opted to use the Intermediate tyres to continue with this work, however it became clear the track was too dry. With Jules, as the track condition was not suited to tyre work at the start of FP2, we did carry out some of our aero measurements in order to decide on parts which we have been looking to run for a few weekends. Both cars then completed a fairly typical programme with the slight difficulty of a rapidly improving track, however with the long run data under our belts we are sure we have gathered enough information to make the right decisions for the race. We are looking forward to what is currently looking to be a dry Saturday and hopefully tomorrow we will be able to focus more on our qualifying pace."